Emotional Release. An Astonishing Mechanism of Inner Change. Emotional release is the natural mechanism we use as children to free ourselves of the stuck energy within our body. As adults, we are more attuned to suppressing our emotions instead of freeing them. Our website aims to help you regain your natural power. The power that you have always had. By letting go of that which no longer serves you, you begin to discover a new sense of purpose and you begin to drop all the limitations that you previously lived your life by. Emotional release or emotional clearing as it is sometimes known can be seen as a healing mechanism which enables us to become more whole. In other words, it can also be seen as an integration of our true self. That is why it is also called emotional integration. It is something that is inherent within ourselves because releasing or integrating stuck emotions is what we do naturally. However, because of our conditioning we are taught to suppress and so we spend most of our lives doing this instead. This stuck energy does not go anywhere. It remains stuck within our bodies where it is said to create disease, tension and all manner of mental and physical illnesses. Releasing trapped emotions or healing emotional pain is therefore the key to both our mental and physical wellbeing. Without some sort of emotional release therapy, we will be forever stuck and controlled by our emotions. Many times, we release naturally but at other times deep self-enquiry and honesty is needed to let go of that which no longer serves us. This is where we can help. HOW DO WE RELEASE OUR EMOTIONS? Follow the process of releasing your emotions in a safe effective way. The first step within the process is awareness. This is an understanding that in this current moment you have been emotionally triggered and there is a recognition that your state of being has changed. Also within this step is an understanding that this emotion comes from within you and that you alone are 100% responsible for the creation of it. At this point, you may need to become aware that the mind has projected responsibility outside you to some external cause. The true creator though is you. It is your emotion and therefore you are always responsible for it. Acceptance of feelings and their corresponding bodily sensations happens during the next step. Acceptance is the process of embracing all feelings and emotions that are present. There will naturally be resistance and this must also be accepted. Resistance will come in the form of thoughts, muscle tension, tightness and even perhaps tiredness. It will also come in the stories that you tell yourself of what is happening to you and why. Accepting the present moment is key. The 3rd step in the process is allowing. By sitting quietly and observing you allow all feelings to be present within your experience. You are completely open to what is happening in this moment. You allow your emotions to magnify or to diminish and you just observe what happens from a detached perspective. Your observer point of view allows you to step outside the story and see things objectively. John Ruskin calls this process Direct Experience. This is the process of feeling whatever is happening in the NOW. You do not need to do anything. You just sit. Observe. Feel. The final step is not really a step. Here emotional release happens automatically. You do not need to do anything. Your awareness, acceptance and allowing help this process to happen. These previous steps allow you to be taken to a place where releasing becomes natural and spontaneous. At this point you will experience a lighter sensation within you. You may feel happier, even healthier. People have reported aches and pains disappearing. You may also report that your mind suddenly becomes still. There is less thinking and less need to do. We are passionate about emotional release therapy and this informative website will show you exactly why many people think the same. Its goal is to introduce to you to why you might start to consider thinking about emotional release. From there we introduce you to the benefits that releasing our feelings may bring and further on we give you some tools and techniques you can use to help you along the path. There are free workshops located in London and chargeable one to one sessions with the website author. 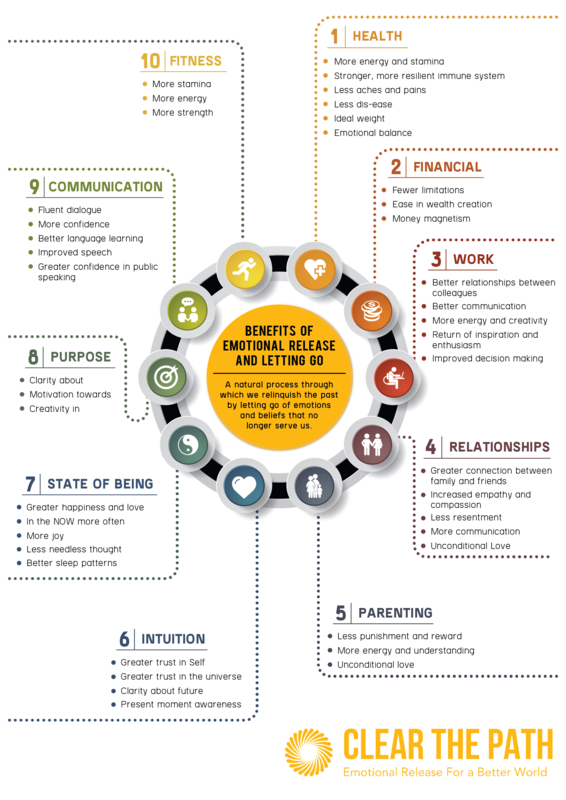 There are several benefits that emotional release therapy may bring and the more you work with releasing the more you understand what they are. Persistence is the key. We want to give you the knowledge and belief to develop this persistence and allow the storm of your feelings to be processed. We want you to be able to come out the other end lighter and with a renewed sense of purpose about your life. Letting go of grief or releasing anger is something that everyone can do. The challenge comes when we do not even know we are carrying these emotions. Often denial goes hand in hand with suppression and when we deny we cannot let go. Clearing negative emotions is therefore the goal of many such therapies and also of this website. However, to be free we need to be honest about ourselves and sometimes this is the hardest part. Contact us for your emotional detox and one to one sessions or any questions you may have. Our feelings and emotions are what we constantly run away from. We keep experiencing the same patterns in life because we never allow a feeling to run towards completion. When a negative feeling appears we do almost everything to distract ourselves from it and it’s because of this that we re-experience events in our lives. Our health, wealth and relationships all benefit from facing our feelings and why this works will be covered throughout this website. We see a gradual improvement in all aspect of our life once we begin letting go of suppressed feelings. There is not one single area that cannot benefit from releasing.